Swedish childhood cancer care needs more resources. A review from the Swedish Childhood Cancer Fund has revealed a shortage of nurses, hospital beds and time. It is severely affecting children suffering from cancer and their families. One in four beds is not available, and seriously ill children are being forced to move to other departments and hospitals. 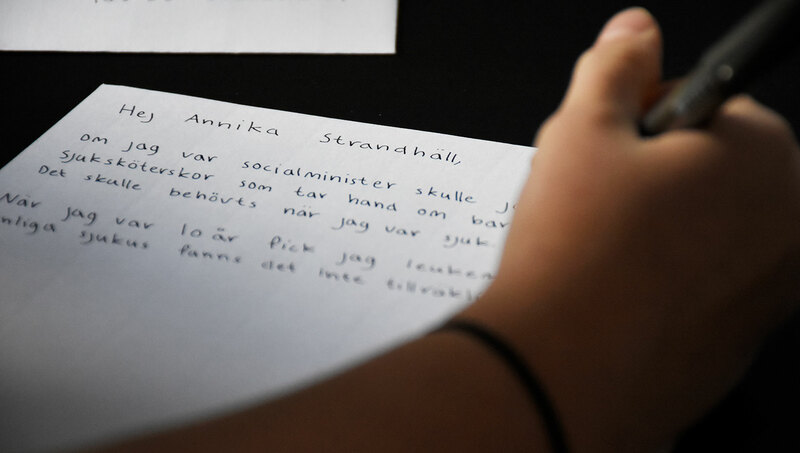 In order to instigate a change, the Swedish Childhood Cancer Fund and Narva produced a lobbying campaign with the aim of providing information about the shortcomings within Swedish childhood cancer care and to convey to politicians concerned the Swedish Childhood Cancer Fund’s demands for change. With an election year approaching, we perceived an opportunity to arouse public opinion in relation to the issue of staff shortages within Swedish childhood cancer care. It is an important issue and one with which the public’s help and pressure could enable us to reach all the way to the Ministry of Health and Social Affairs. Building widespread public engagement increased our chances of achieving the ultimate goal of getting the Minister of Social Affairs, Annika Strandhäll, to address the problem and meet the Swedish Childhood Cancer Fund. In order to reach out to and access the relevant decision makers, we created the integrated campaign, ”If I was Minister of Social Affairs”. Instead of having the Swedish Childhood Cancer Fund as the primary voice for the campaign, we had three childhood cancer survivors take the central role. By conveying their stories and experiences of childhood cancer care on social media, our aim was to generate attention and promote engagement. They told what they would do for childhood cancer care if they were the Minister of Social Affairs and concluded with a desire to meet up with precisely the Minister of Social Affairs. With a major engagement on social media, we reached Annika Strandhäll in just a few hours. The campaign received a lot of attention with a total reach of almost 18 million in editorial media. The children’s films have been shown over one million times and been shared over 23,000 times, with no sponsorship of the contributions. The Swedish Childhood Cancer Fund now has a closer dialogue with Annika Strandhäll about what needs to be done to improve the care situation and skills provision within childhood cancer care. Annika has also promised to allocate SEK 500 million per year to cancer care and for the first time ever earmarked a budget specifically for childhood cancer care. Most important of all however, the children had the chance to experience what it is like to be Minister of Social Affair for a day and convey what is required to improve childhood cancer care.